Since June 2003 Tar Heel Basement Systems LLC, has installed millions of square feet of CrawlSealTM vapor barrier in thousands of homes, from the North Carolina High Country to the Triad. Good Job. The office staff, installation crew, and system designer all did a great job. Two specialty crews came. Both were great! Everyone I have dealt with @ your company has been very courteous! You guys did a great job! Your installation crew is a great bunch of guys! Very nice and professional. Feels good not having a wet basement and putting up with the mold. Great job done! A company in Knoxville referred you to me. Your rep, he did a really good job. Very impressed, informative, and willing to answer all questions. Everything was done right. Very professional. Thank you for your great team! Thanks! I don’t have to worry about a leaky basement anymore!! A 10. Both Jason Chapman and Garrett Atkinson were helpful, informative, friendly and professional…….excellent. Head and shoulders better than others. Wonderful, very professional. I would recommend the products to anyone! Thank you for a friendly and thorough job. They were great. You did a very good job. I am well pleased with the work your crew did. Xander seemed very knowledgeable and spent the time to come up with a detailed solution. Matt Johnson was positive, courteous, and professional. We felt good about your company. The crew that came here worked very hard and did an excellent job! Bobby & Kevin treated my property as it was theirs. Very good job!! The Installation Crew was great, very friendly, helpful, and courteous. The Installers were really awesome! A great company that provides a needed service for a lot of homeowners. “All Things Basements!” is golden! I am a previous client. Yes, much positive advice was given. Very appreciative of Mark. Great guy. Was great. Easy to talk to. Knowledgeable. Geoff went above and beyond. Best salesman and results. Absolutely one of the best companies I have ever worked with. Excellent work, very, very pleased. Very satisfied. Extremely customer friendly and helpful. A great experience for us. Thank you! Ryan Arnett was professional, personal and likable. He was knowledgeable and patient. Answered all our questions. Excellent. Best sales rep I talked to. Explains things clearly with no pressure and answers all questions! Mike was great! He was very thorough and spent a lot of time explaining recommendations to me. Top-notch, thorough and polite. Very positive experience, great job! Best customer service we have received since living in NC. On-time, friendly, helpful. Better information and excellent customer service. He was very informative, polite, approachable and answered all of my questions. Can’t wait to recommend this fantastic company! Very efficient and nice. Call backs and questions were answered promptly, very satisfied. Greg did an awesome job, really professional. What he proposed is exactly what we need. Excellent! Knowledgeable, friendly, professional, courteous. I can’t say enough good things about him. Ronnie Whittaker did an excellent job with installation of dehumidifier. Very personable and nice. Courteous, knowledgeable, and sincerely interested in solving our problem. Hire more reps like Mike Jones. Excellent job, it looks bright & clean in there. Hard workers dedicated to getting the job done. We were amazed with how the product works. We were very pleased with everything! Displayed good knowledge of the system and reported his findings in a clear, concise manner. Very impressive, very smart management, excellent customer service. Employees who seem very satisfied and do good work. Professional, friendly & courteous. Thanks for the great work!! Most professional company we have ever dealt with in NC. Mike was great to work with! Very professional and answered all of my questions. Your product beats trying to jack and pour new concrete footings. Professional, experienced, efficient and courteous. “VERY” Satisfied. Hospitable and efficient. Always accommodating. Your Sales Representative and your installation crew were outstanding! I am very pleased! Excellent representative. Very knowledgeable, understanding, good listener, made me feel at ease with the process. Jordan was outstanding. His presentation was very professional and addressed all of my questions and concerns. Daniel was professional, polished, punctual and phenomenal. Top notch guy. I was also impressed with Ryan, who accompanied Daniel. I am very satisfied. I liked that you worked from the inside of the basement instead of the outside. Daniel was helpful and was very knowledgeable. Mike Jones was impressive and did a very good job presenting the solution. Based on your previous work on at our home. Matt was our salesman–he is outstanding! Jordan was very nice and knowledgeable. Extremely courteous, friendly and professional. Appearance was professional. Ronnie did a 1st class job of representing Tar Heel Basement Systems. Ronnie Whittaker was excellent with setting up the job, responding to any questions and followed up with completion. Very efficient. Bobby Lutrell is an excellent service technician. He is always very cordial and professional in his manner and work ethic. My dehumidifier works so well and I LOVE it! Ronnie is very professional and pleasant. I would give him a 10! I chose your company because of honesty and I am extremely satisfied with the work. Geoff Keller was polite, professional, and knowledgeable about your company. Superior customer service and great team involvement. Prompt & non-invasive. The crew went above and beyond our expectations. Jerimiah was outstanding. Very through and informative. A great representative for your company! Efficient and helpful, friendly crew. Easy scheduling, personable, good information, before and afters. Thanks for the outstanding service! Rick was very professional and friendly. It was a pleasure dealing with him. Mr Alexender explained everything very well. Good detailed and impressive. Very good. Friendly, knowledgeable, informative. Set a good example, very professionable. Very satisfied. Crew seemed to love the company they worked for. Courteous staff. Xander was great. He was friendly, professional, knowledgeable, and best of all, straight forward. Awesome. Matt was such an awesome person. Everything went great. I was fully impressed. Professional and organized presentation. Took time to answer my questions and ensure my understanding. Excellent asset to your company. Great bunch of guys they know what they are doing and do it well. Your company is known as the best. Believe me, I have done my homework! You guys are great and I would recommend you to anyone who needs your services. Ryan was very professional, engaging, and knowledgable. Tim was great–very thorough, helpful and knowledgeable. Great team! We thanked the Lord that we found you–in my past I have problems from another company. Ryan was very professional and explained everything clearly with no sales pressure. It was a very good meeting. Very professional, very informative, excellent people skills. I learned very important information from his discussion regarding my crawl-space problems. Ronnie was extremely knowledgeable and knew the exact procedures to follow. Professional and dressed to favorabley represent the company. Very impressed with his knowledge, friendliness and over all good guy attitude! Good; Michael Jones was prompt, professional; helpful; excellent rep. Very satisfied! All of the work done was inside of the basement. Very good work ethic (all crew members). Excellent- Matt was very informative and it was obvious he takes pride in his work. I LOVE my basement now. Trevor did a great job. Your company did everything they said they would do. Came when they said. Very Satisfied! Alex Lemon and your installation crew definitely deserve the “WOW Service Award!” They did a super job!! Very impressed! Professional, personable and knowledgeable. Loved the presentation. Thorough, professional, polite and motivated. Cleanest way to resolve my problem. Positive experience. Neat, friendly, and very professional. Monica was very nice, helpful, and prompt in answering all my questions! Very organized and prompt in getting the process started. I have been pleased with the company in all of my dealings. Great folks– its nice not to be mopping up water in my basement! Heath was very informative, and provided me with several options to repair my problem. Rick was very knowledgeable and did a detailed check in the house and under the house. Well pleased. I am Pete Burgess, and along with my beautiful wife Nancy, we are the founders and former owners of Tar Heel Basement Systems. We have two wonderful daughters, Hillary and Kari; and two amazing granddaughters, Clare and Irene. I am originally from Illinois, graduated from the University of North Carolina where I met Nancy, got my MBA from Northwestern University, was a commissioned officer in the Navy, and am a licensed general contractor in North Carolina and Virginia. After years in the business world in Chicago, I tried to retire and find solitude with Nancy in the beautiful Blue Ridge Mountains. Upon building our dream home and encapsulating the crawlspace, I became a firm believer in the CrawlSeal product. My retirement was short lived as we grew a “one man operation” (me!) into a multi-service operation with nearly 100 employees, necessitating a relocation of the business to Winston Salem, North Carolina from Boone, North Carolina. While it is hard work owning a growing business, I love what our company is about. We are truly a need service and there is no greater satisfaction than solving a homeowners’ basement, crawlspace or foundation issues! Finally, in November of 2017, Nancy and I merged our company with Groundworks LLC out of Virginia Beach, Virginia to allow us the freedom to grow beyond the artificial boundaries we had been forced to honor by our previous affiliation with a major material supplier. We now service the entire state of North Carolina and are the largest crawlspace encapsulation, basement waterproofing, foundation repair and concrete lifting company in the state. 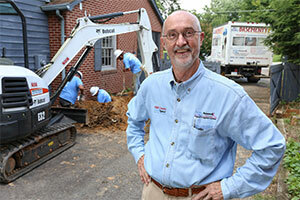 Meet Pete Burgess, owner of Tar Heel Basement Systems. Since Tar Heel Basement Systems is a debt-free corporation, customers should be very comfortable knowing the financial strength behind us. We are also an A+ rated, accredited member of the Better Business Bureau. We are a certified installer of dry basement and crawlspace technology. Recommended by Sid Greene in Boone. I used you for the initial install. Good company providing a great product performed great people. Website is how I found you,then a friend told me he had use you. The company began by specializing in crawlspace encapsulation and now specializes in basement waterproofing, crawl space encapsulation, as well as foundation repair. The company has grown every year it has been in business, including through the 2007-2010 recession, and the original fleet of one cargo van has increased to 15 production box trucks and 6 service vans. We now employ over 100 people. The evolution of Tar Heel Basement Systems is very exciting and we look forward to continued future growth and success. In North Carolina, we serve Boone, Blowing Rock, Banner Elk, Burnsville, Linville, Lenoir, Taylorsville, Sparta, Hudson, Roaring Gap, King, Lewisville, Walkertown, Yadkinville, Spruce Pine, West Jefferson, Jefferson, Winston-Salem, Thomasville, Mount Airy, Elkin, Clemmons, Lexington, High Point, as well as many areas in between.